My partlet is patterned after those found at the end of the 1550s. It is made from linen and embroidered with black silk. It is closed by hook and eye, as referenced on page 150 in QEWU. While Queen Elizabeth’s partlets and those of other high-status women would have been heavily embroidered with silks, metals and gems, partlets of the middle class would have been more plain. I have chosen to embroider only the collar of my partlet. In addition, many middle-class and lower-class partlets were lined for warmth. I chose not to line my partlet because 21st century Virginia has a much warmer climate than 16th century England and I don’t believe in making garments that I can’t wear. The theme of the contest for this year’s Chalice competition is the Minotaur. 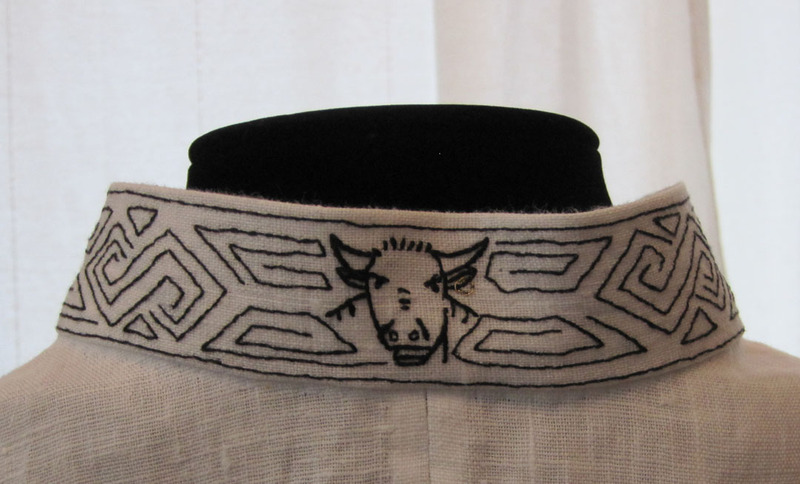 Because Elizabethans loved mazes for their gardens, and the myth of the Minotaur contains a labyrinth, I chose to embroider a modified maze on the collar. The Minotaur is seen in the center back of the collar in the middle of the labyrinth. 1. I created a body block to fit my upper torso and shoulders. 2. 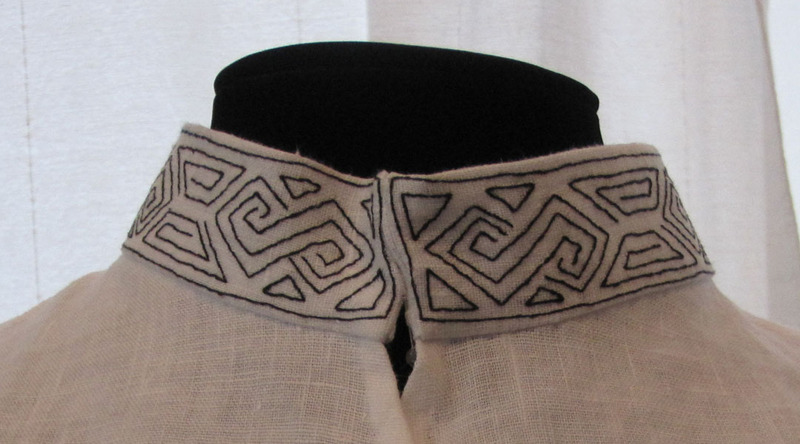 I embroidered a collar using blackwork stitch on uneven-weave linen. 3. I sewed the collar to the partlet. The partlet has a curved front on the dress dummy. That is because I have a large bust and anything that is supposed to look straight on a large busted person must be constructed with a curved front. 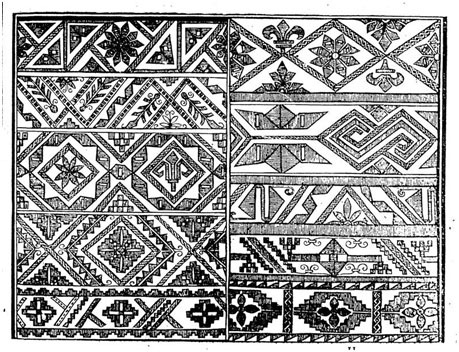 The pattern for the partlet embroidery is based on a book of patterns published in “A Scholehouse for the Needle.” Schorleyker contains sets of patterns found throughout English embroideries of the 16th century. I chose a pattern from the second column below, second pattern from the top. I repeated the pattern, modifying it slightly from the original. As seen in the image above, the linen is not even-weave. I had not planned on using a blackwork stitch, but the stem stitch proved to be too lumpy, so I had to unpick 50% of my finished work and redo it in blackwork stitch. Unfortunately, the blackwork stitch looks jagged because of the weave of the fabric. 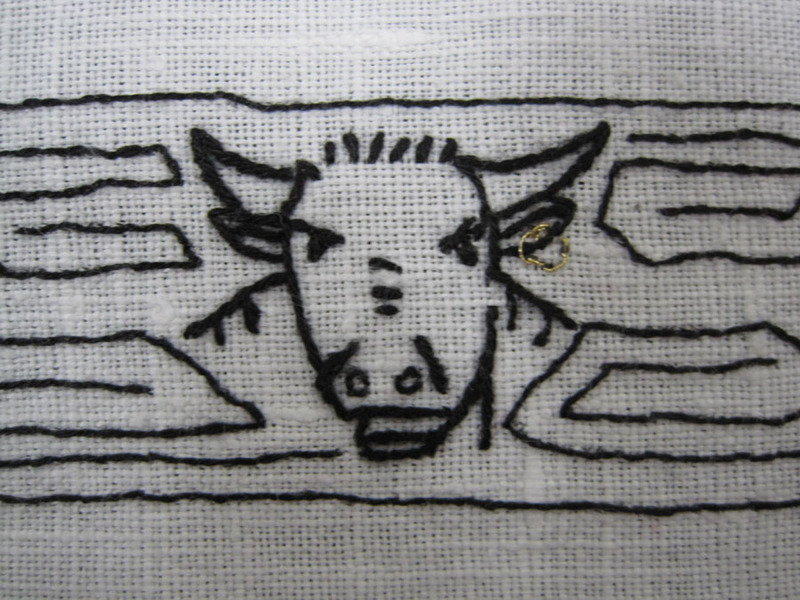 If I use blackwork again, I will use even-weave linen next time. As Arnold mentions in her book, it is often impossible to tell a partlet from a smock, especially since partlets often had matching sleeves. However, the portrait at left is used as an example of a partlet in the Arnold book on page 151. An Unknown Child by a member of the Flemish School, c.1545-55. (Metropolitan Museum of Art, New York). 1. Arnold, Janet. Queen Elizabeth’s Wardrobe, Unlock’d. 1969. 2. Mikhaila, Ninya and Jane Malcolm-Davies. The Tudor Tailor: Reconstructing Sixteenth-Century Dress. Costume and Fashion Press, 2006. 3. Shorleyker, Richard. A Schole-House for the Needle: Produced from the original book printed in 1632 and now in the private collection of John and Elizabeth Mason. Much Wenlock, Shropshire: RJL Smith & Associates, 1998. 1. Folger Shakespeare Library. The Trevelyon Miscellany of 1608 : a facsimile of Folger Shakespeare Library MS V.b.232. Edited by Healther Wolfe. http://luna.folger.edu/luna/servlet. Author: Thomas Trevelyon.